My hand is raised high! It can be hard to generate sales during these slow seasons. I am still learning how to do this (yep, even after 3 years on Etsy). 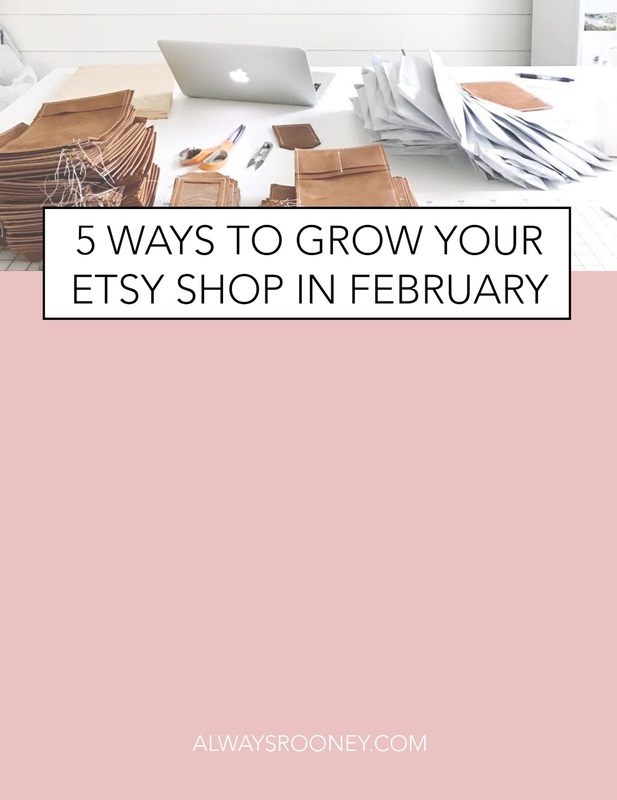 I thought it would be fun to create an Etsy Challenge each month with new ideas on how to create sales organically for your Etsy shops. I'll be joining in on the challenge, so let's do this together! Before we get to the challenge, I want to encourage you to make a goal for this month. Write it down on paper and hang it where you will see it every day. Maybe this looks like making your first sale. Maybe it means creating a new product. It may even be to generate enough sales so you can give more this month to non-profits or causes close to your heart. Just make sure you write it down and hang it up! Click here to sign up for my Etsy e-mail list & automatically receive a February goal setting download. 1. Have a Valentines Day sale- Is your product perfect for a Valentines day gift? Create a special sale just for this season. Make sure this sale runs in time for the buyer receives your product in time for giving it as a gift! 2. Create a product for couples- This is the month centered around love, right?! Think about your products through that lens. Can you offer a special package deal for your buyers? For instance, I am going to offer a Mr. & Mrs. Passport Cover Set for a discounted price for this month only. This makes gifting a breeze for your customers! 3. Launch a new product- Now is the perfect time to launch a new product since things have slowed down. Pair the launch with a Valentines Day sale, and it is sure to be a hit! 4. Reach out to new influencers to work with- Make a list of people you would love to send your product to and work on crafting a pitch email or even ask if you can send them a free product. If they love it and it fits their style, they are sure to post about it. Influencers include bloggers, instagrammers, youtubers and even local businesses! Remember that partnering with one influencer that is align with your aesthetic and niche is better than 10 influencers that don't line up with your vision! 5. Change your listing tags- Etsy is essentially a search engine. Like blogs and websites, you have to work on your SEO to improve your probability buyers will find your shop in the sea of other options. Review the current tags on each of your listings. Add a few that are season geared and remove tags that aren't working for you. How do you know which tags are working for you? Check out your stats page and see what searches are converting people to your shop! Alright, it's February 2 so we have 26 more days to see growth this month through these simple challenges. I'd love to hear how it is working for you, just comment below or leave me a comment/message on Instagram!